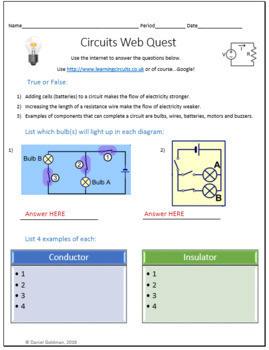 This one page (front and back) Circuits Science webquest helps students develop their internet search skills while advancing their reading and understanding of informational text. 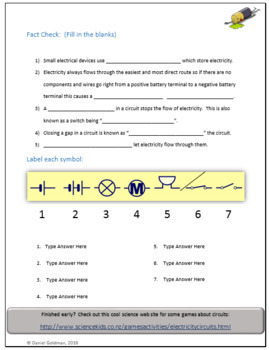 This is a great introductory lesson to help students develop beginning or deepen knowledge of Circuits Science. Students learn about circuits, components such as bulbs, wires, motors, buzzers, batteries (cells), on and off switched, conductors, insulators, resistance wires, circuit symbols and more. 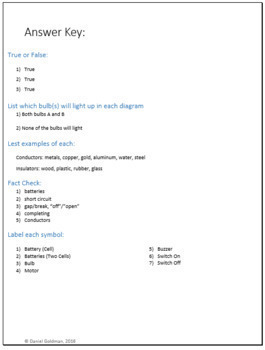 Answer Key and extension activity included. This lesson links with Common Core reading informational text skills. Resource types are Microsoft Word files which you can edit and tailor to your liking as well as PDFs. 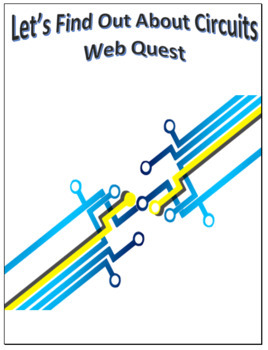 ***Your purchase INCLUDES a separate printable worksheet version of the file for teachers who want to print the webquest out and make copies for their class to complete with pen/pencil. This document is for personal use only and may only be used by the original purchaser. Copying for more than one teacher, classroom, department, school, or school district is prohibited. Additional licenses can be purchased at a discount for others to use in your department. You may not electronically distribute or post this product online where it can be accessed by the public (school INTRANET site that only students can access is fine like Google Classroom or Canvas). Failure to comply is a copyright infringement and a violation of the Digital Millennium Copyright Act (DMCA).